Because reading a retrospective on the most sensible salads that San Diego ate in 2013 would be about as much fun as eating a sensible salad, here is an epic look back at all the glorious fatness that graced our palates and gullets this year. If we survive to see the end of it, 2014 should be even bigger. For a brief, magical moment over the Summer, this was the talk of the San Diego County Fair, and dare we say, the nation. 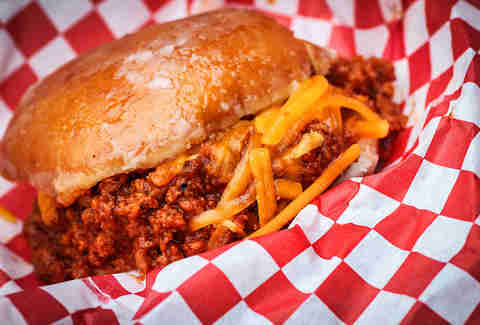 It is as beautiful as it is simple: sloppy joes and glazed donuts, together in harmony. One can only imagine what glorious gastronomic developments the 2014 fair will hold, because the 2013 edition was a doozy. You know, considering it's deep-fried bacon... 655 isn’t too bad! 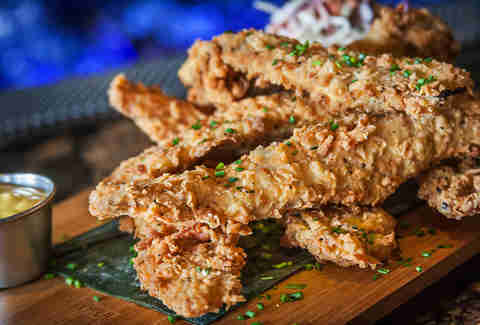 Applewood-smoked slices of bacon that are double-battered, deep-fried, and served on a wooden plank with Jack honey mustard sauce for dipping. This is progress, people. 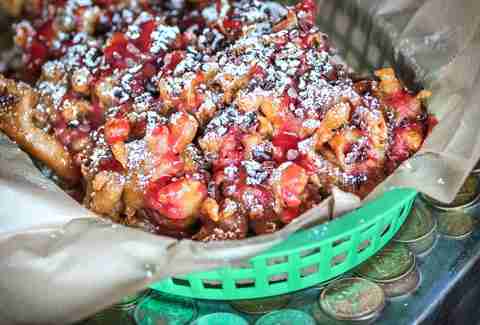 With this "Royale Style" funnel cake from San Diego arcade/eatery Coin-Op, you'll get magically transported to probably the fanciest carnival you could ever imagine. It's a heaping portion piled with strawberry sauce, cocoa nibs, a drizzling of honey, and a generous dusting of powdered sugar. 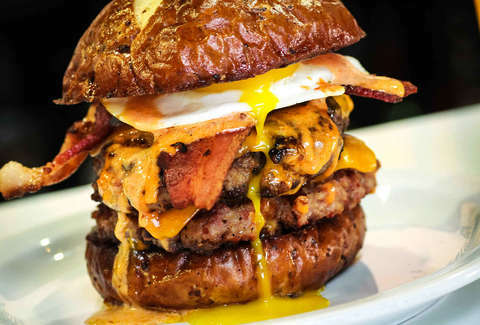 Pro Tip: Don’t request the Royale with cheese. Sure, there are now plenty of donut burgers saturating the market, but what about enveloping other sandwiches in a delicious, cakey pastry? 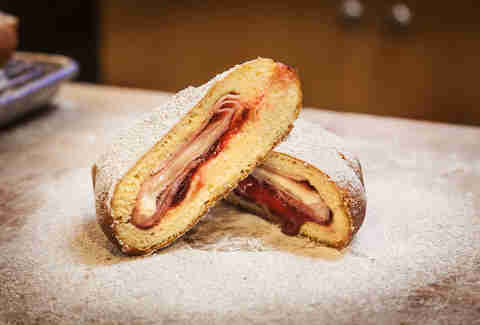 Standing at the vanguard of history is Donut Bar, which's taken the ingredients of a Monte Cristo -- Black Forest ham, Emmentaler -- and combined them with American cheese and cran-raspberry compote in a giant, powdered sugar-topped donut. Alexandre Dumas would be pleased. 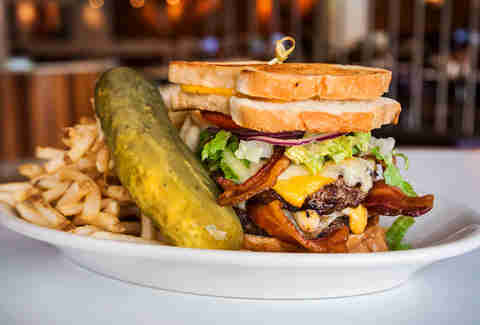 Named after the much-loved former Hard Rock employee who created it, Maryjane’s will make the Mirv Burger on request, but bring your appetite -- this is a double burger between two grilled cheese sandos made with four kinds of queso and piled with lettuce, tomato, onions, and pickles. 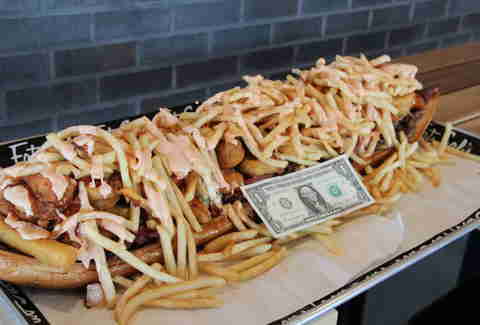 The restaurant's name could also potentially come into play as a performance enhancer when it comes to finishing it. 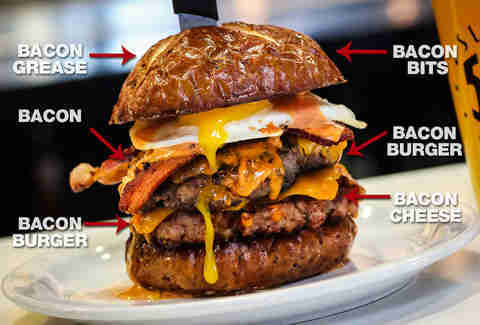 Testing the theory that there is no such thing as too much bacon: this 100% ground bacon patty (you can choose the number of patties to make yours a 1/3, 2/3, or full 1lb burger, so... make the right choice...), topped with MORE BACON, layers of cheddar cheese, a sunny-side up egg, all placed lovingly within a bacon fat pretzel bun that’s covered in creamy "bacon island" dressing. It made its appearance in July… can’t wait to see what they have in store for America’s bday in 2014.